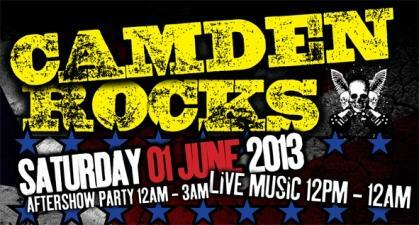 CAMDEN ROCKS – Why, yes it does. And so does this gem of a multi-venue shindig. Over 100 bands in a day packed in to 12 sweaty, boozy N1 venues. If you want to see them in London before they are big, then this is most definitely for you! The festival takes place on Saturday 1 June 2013 over 12 venues in NW1 and will feature over 100 of the hottest names and up and coming talent from all over the UK. For full details on the bands and venues, go to the official Camden Rocks website. We have 3 pairs to be won. To enter, correctly complete the competition question and entry form below. Good luck! *Standard T&Cs apply. Entrants must be 18yo+. Transport and expenses are not included. The prize is the tickets only and cannot be transferred or exchanged. The winner must produce photo ID to collect the prize.